Japanese oil demand fell y/y for a second straight month, by 0.28 mb/d to 3.82 mb/d. Kerosene led the weakness in demand, falling by 76 thousand b/d y/y to 0.51 mb/d, amid lacklustre heating demand due to mild winter temperatures. We expect heating demand to stay subdued throughout the winter, as weather models forecast mild temperatures to persist through to April. Mild temperatures also weighed on demand for fuel oil and direct crude burn, which were down y/y by a combined 74 thousand b/d. Shikoku Electric Power plans to decommission its aging 125 MW and 220 MW oil-fired units at Anan, Tokushima prefecture, after restarting its 890 MW Ikata No. 3 nuclear reactor in November 2018. Automotive fuel demand was weak too, as diesel and gasoline fell y/y by 11 thousand b/d to 0.61 mb/d and 22 thousand b/d to 0.92 mb/d respectively. Propane demand fell by 58 thousand b/d y/y to 0.41 mb/d, amid weakening steam cracker margins, while naphtha demand fell by a smaller 10 thousand b/d to 0.81 mb/d. 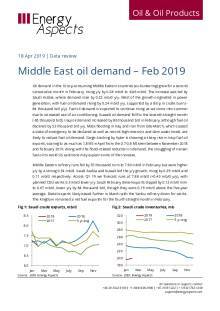 Jet demand remained flat y/y at 78 thousand b/d. Refinery runs fell by 0.19 mb/d y/y in December, to 3.22 mb/d, as the delay in issuing Iranian waivers by the US to early November meant like Korea, India and China, Japan also struggled to source alternatives in October for December arrivals. Japan imported no crude from Iran for a second straight month, while US imports rose to a record 0.20 mb/d (+0.15 mb/d y/y). Loadings from Iran resumed in January (arriving February) after shipping, insurance and banking issues were resolved. Overall crude imports fell by 0.18 mb/d y/y to 2.99 mb/d, pushing crude stocks lower by 7 mb m/m. Japan was a net gasoline exporter at 83 thousand b/d (-9 thousand b/d y/y).